Well now, there’s no better way to usher out the first month of the year than with a great new Firefox release. It’s winter for many of us, but that means more at-home time to install Firefox version 65, and check out some of the great new browser and web platform features we’ve included within. Unless you’d rather be donning your heavy coat and heading outside to grit the driveway, that is (or going to the beach, in the case of some of our Australian chums). At Mozilla, we believe that new features of the web platform are often best understood with the help of intuitive, visual tools. That’s why our DevTools team has spent the last few years getting feedback from the field, and prioritizing innovative new tooling to allow web devs and designers to inspect, edit, understand, and tinker with UI features. 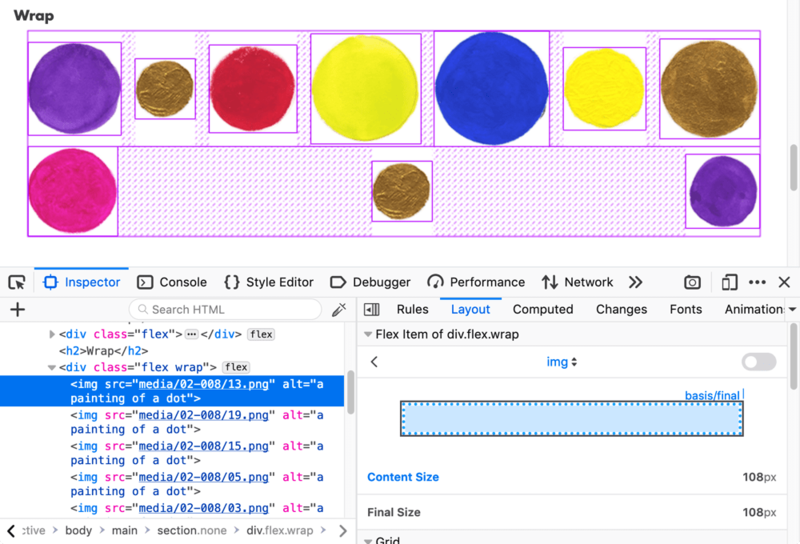 This drive led to the release of the CSS Grid Inspector, Font Editor, and Shape Path Editor. Firefox 65 sees these features joined by a new friend — the CSS Flexbox Inspector — which allows you to easily visualize where your flex containers and items are sitting on the page and how much free space is available between them, what each flex item’s default and final size is, how much they are being shrunk or grown, and more. When you’re done tweaking your site’s interface using these tools, our new Changes panel tracks and summarizes all of the CSS modifications you’ve made during the current session, so you can work out what you did to fix a particular issue, and can copy and paste your fixes back out to your code editor. We have also added an advanced color contrast ratio display. When using the Accessibility Inspector’s accessibility picker, hovering over the text content of an element displays its color contrast ratio, even if its background is complex (for example a gradient or detailed image), in which case it shows a range of color contrast values, along with a WCAG rating. You can find about these features in more detail and read about other incremental improvements in the DevTools section of Firefox 65 for developers. If you’d like to know more about how the Firefox DevTools are created, check out Victoria Wang’s Designing the Flexbox Inspector post. A number of CSS features have been added to Gecko in 65. The highlights are described below. CSS environment variables are now supported, accessed via env() in stylesheets. These variables are usable in any part of a property value or descriptor, and are scoped globally to a particular document, whereas custom properties are scoped to the element(s) they are declared on. These were initially provided by the iOS browser to allow developers to place their content in a safe area of the viewport, i.e., away from the area covered by the notch. We’ve added the steps() CSS animation timing function, along with the related jump-* keywords. This allows you to easily create animations that jump in a series of equidistant steps, rather than a smooth animation. Note: The steps() function was previously called frames(), but some details changed, and the CSS Working Group decided to rename it to something less confusing. 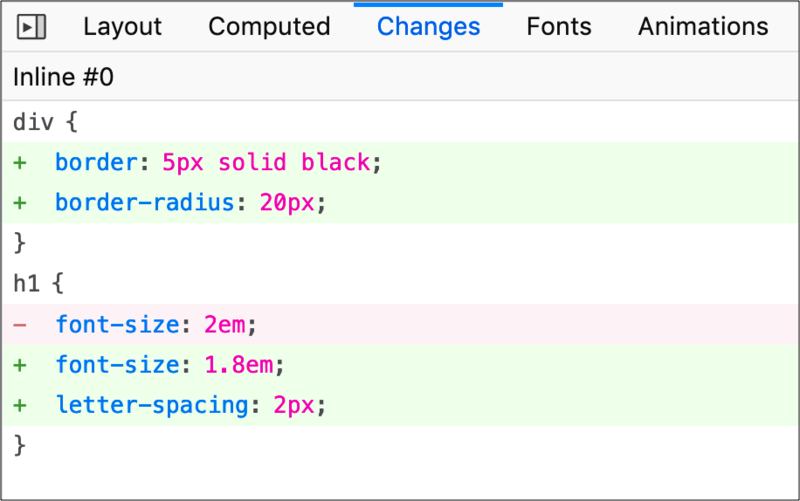 New break-before, break-after, and break-inside CSS properties have been added, and the now-legacy page-break-* properties have been aliased to them. These properties are part of the CSS Fragmentation spec, and set how page, column, or region breaks should behave before, after, or inside a generated box. Readable streams are now enabled by default, allowing developers to process data chunk by chunk as it arrives over the network, e.g. from a fetch() request. You can find a number of ReadableStream demos on GitHub. The Intl.RelativeTimeFormat constructor allows you to output strings describing localized relative times, for easier human-readable time references in web apps. console.log(rtf1.format(2, 'day')); // expected output: "in 2 days"
console.log(rtf2.format(2, 'day')); // expected output: "dentro de 2 días"
The globalThis keyword has been added, for accessing the global object in whatever context you are in. This avoids needing to use a mix of window, self, global, or this, depending on where a script is executing (e.g. a webpage, a worker, or Node.js). The FetchEvent object’s replacesClientId and resultingClientId properties are now implemented — allowing you to monitor the origin and destination of a navigation. Lastly, to avoid popup spam, Window.open() may now only be called once per user interaction event. At long last, Firefox 65 now supports the WebP image format. WebP offers both lossless and lossy compression modes, and typically produces files that are 25-34% smaller than equivalent JPEGs or PNGs with the same image quality. Smaller files mean faster page loads and better performance, so this is obviously a good thing. Not all browsers support WebP. You can use the <picture> element in your HTML to offer both WebP and traditional image formats, leaving the final choice to the user’s browser. You can also detect WebP support on the server-side and serve images as appropriate, as supported browsers send an Accept: image/webp header when requesting images. Images are great, but what about video? Mozilla, along with industry partners, has been developing the next-generation AV1 video codec, which is now supported in Firefox 65 for Windows. AV1 is nearly twice as efficient as H.264 in terms of compression, and, unlike H.264, it’s completely open and royalty-free. Support for other operating systems will be enabled in future releases. The MediaRecorder pause and resume events are finally supported in Firefox, as of version 65. For developers creating WebGL content, Firefox 65 supports the BPTC and RGTC texture compression extensions. Support for Handoff between iOS and macOS devices is now available. Preferences for content blocking have been completely redesigned to give people greater and more obvious control over how Firefox protects them from third-party tracking. The about:performance dashboard now reports the memory used by tabs and extensions. WebSockets have been implemented over HTTP/2. Lastly, for Windows administrators, Firefox is now available as an MSI package in addition to a traditional self-extracting EXE. We’ve added some useful WebExtensions API features too! The Tabs API now allows extensions to control which tab gets focused when the current tab is closed. You can read more about the motivation for this feature on Piro’s blog, where he discusses it in the context of his Tree Style Tab extension. The web often contains conflicting, non-standard, or under-specified markup, and it’s up to us to ensure that pages which work in other browsers also work in Firefox. supports even more values of the non-standard -webkit-appearance CSS property. behaves the same as other browsers when encountering the user-select CSS property in nested, shadow, or content editable contexts. clears the content of <iframe>s when the src attribute is removed, matching the behavior of Safari and Chrome. For more details on the added features mentioned above, plus other minor additions, see Firefox 65 for Developers on MDN, and the official Firefox 65 Release Notes. You may also be interested in the Firefox 65 Site Compatibility notes. Great changes, especially the “Changes” tab in the DevTools and WebP support! Great!, I am Firefox fan forever. Thank you very much for your work ! Nice and useful improvements in this version ! THANKS FOR EVEVYTHING DON”T GIVE UP ON ME YET!! AND I WON’T FORGET!!!!!!! thanks for your awesome work, I love to work with Firefox (nightly)! There is one little thing bothering me: in the german translation of the dev tools grid inspector “grid” is translated rather unfortunately as “Gitter” – an oversight or an uninformed choice. German speaking designers use the term “Raster” for “grid”. It would give me peace of mind and happiness indeed were you to set this right, you dear people. Glad you like it! and thanks for passing on your comment about the German localization. I”ve passed it on to the DevTools team to see if they can update it.